The AElement ANSI version is specially designed to fit on most ANSI A 156.13 doors. 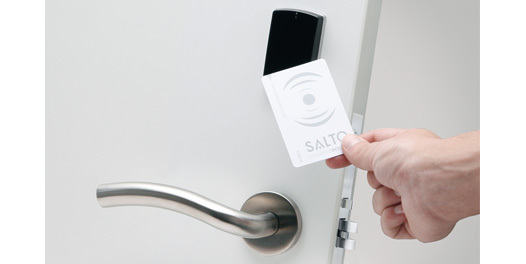 The minimalistic design of the RFID reader looks stylish and discreet on any door. It also offers the choice of a wide range of designs and finishes. ID technologies available: Mifare, DESFire and Mifare Ultralight C.
Reader dimensions: 67mm x 45mm x 17mm. Battery pack dimensions (inside): 116mm x 65mm x 25.5mm. Inside always allows free egress (anti panic in combination with lock). SALTO square spindles available: 8 mm split. Wire-free stand-alone networked system through SVN technology. Wireless ready lock that can be upgraded to wireless online. Fire resistant UL listed (90 min). Fire resistant AS1530.4 listed (60 to 120 min).